37th National Pesticide Forum Kicks Off In New York City Today, with NYC Premiere of “Ground War” film, and Special Guest Lee Johnson Who Successfully Sued Monsanto for His Cancer! (Beyond Pesticides, April 5, 2019) Beyond Pesticides’ 37th National Pesticide Forum, Organic Strategies for Community Environmental Health, begins today at the New York Academy of Medicine, and continues until tomorrow night, where the New York City premiere of the new documentary Ground War will take place with special guest Lee Johnson—who successfully sued Monsanto after linking his cancer to exposure to the weed killer glyphosate. (Tickets are $10 and available through Ticketmaster until sold out, please sign up/log in to a Ticketmaster account to purchase). 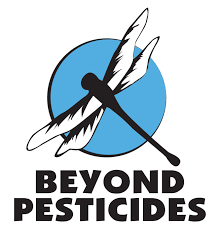 The two-day conference is convened by Beyond Pesticides in collaboration with the Children’s Environmental Health Center of the Icahn School of Medicine at Mount Sinai, and 24 local cosponsoring organizations. The conference begins at 4:30 pm on Friday April 5, followed by a reception and evening session. Saturday includes breakfast and runs from 8:30 am until 5:30 pm. 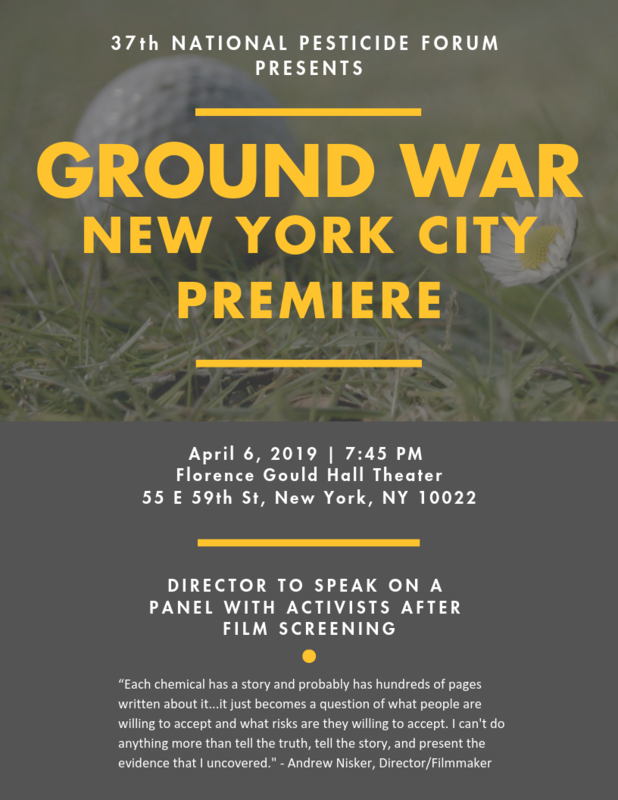 The Ground War screening, to be held at Florence Gould Hall (55 E. 59th Street), starts at 7:30 pm and concludes with a panel discussion featuring advocates and California Groundskeeper Dewayne Lee Johnson. Peter Del Tredici, PhD, recently retired from the Arnold Arboretum of Harvard University after working there for 35 years. He taught in Harvard’s Landscape Architecture from 1992 through 2016 and is currently teaching in the Urban Planning Department at MIT. He is the winner of the 2013 Veitch Gold Medal from The Royal Horticultural Society and has studied the ecology and cultivation of the Ginkgo tree since 1988. Dr. Del Tredici is the author of more than 140 scientific and popular articles including the widely acclaimed “Wild Urban Plants of the Northeast: A Field Guide” (2010). His recent work is focused on urban ecology and climate change. Virginia Rauh, ScD, a member of Columbia’s faculty since 1984 and is Deputy Director of the Columbia Center for Children’s Environmental Health. Her work focuses on the adverse impact of exposure to air pollutants, including second hand smoke and pesticides on pregnancy and child health, and the susceptibility of individuals and systemically underserved populations to environmental hazards. She has been principal investigator on numerous major research projects, including studies of the impact of organophosphorus insecticides. Dr. Rauh serves on numerous national committees, including advisory groups at NIEHS, NICHD, and the Scientific Advisory Board for the Environmental Protection Agency. The conference also includes workshops on a number of salient topics in pesticide reform, including on biodiversity, human health and pesticides, local organizing, organic land management, and methods to leverage the law for health and the environment. See here for a schedule of events. The Forum co-sponsors include: Environmental Law Advocates at Fordham University School of Law, No Spray Coalition, Grassroots Environmental Education, New York Environmental Law and Justice Project, Friends of Animals, New Yorkers for Pesticide-Free Parks (NYPFP), The Sierra Club NYC Group, Sixth Street Community Center, Food and Water Watch in New York, NYC Grassroots Alliance, Garden of Eve Organic Farm & Market, iEatGreen, Perfect Earth Project, Battery Park City Authority, WE ACT for Environmental Justice, Center for Earth Ethics, Brooklyn Grange Rooftop Farms, Northeast Organic Farming Association of New York (NOFA-NY), Clean Water Action NJ, Green City Force, Newtown Creek Alliance, 350 NYC, Green Inside and Out, and more. Tickets are still available for the Forum and Ground War screening (sign in to Ticketmaster to purchase)! This entry was posted on Friday, April 5th, 2019 at 12:00 am	and is filed under Uncategorized. You can follow any responses to this entry through the RSS 2.0 feed. You can skip to the end and leave a response. Pinging is currently not allowed.